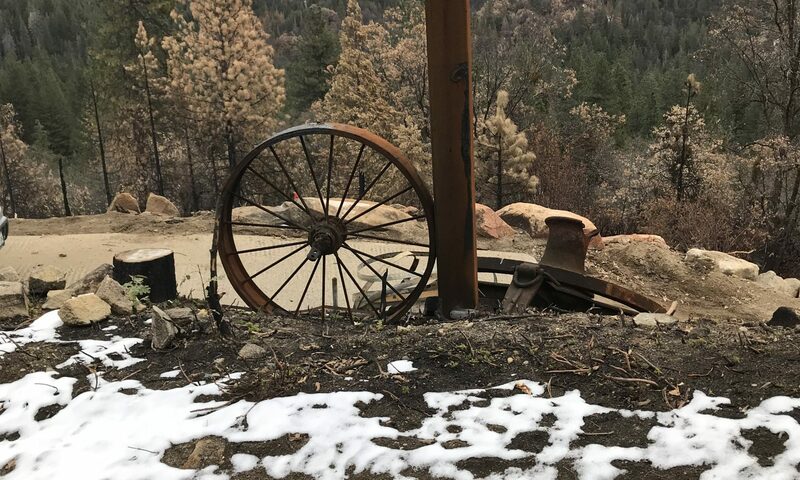 While we were installing the new weather station at the Logger’s Retreat, my wife noticed something was different about the old ore car near our picnic area. She asked me to take a look. The ore car was rotated 90 degrees from its normal position, and the rails it normally rests on were scattered across the yard. 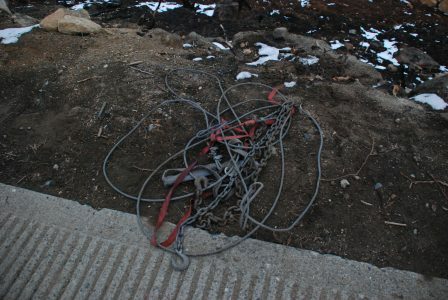 Someone had left these heavy tow chains, a long tow cable and several cargo straps stretched across the hillside above the ore car. 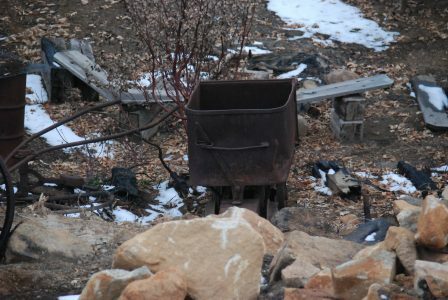 It was pretty obvious that someone had tried (and thankfully failed) to drag the ore car up the hill to the driveway. Apparently they gave up after the cargo straps snapped several times. That made me wonder what else they might have tried to move. 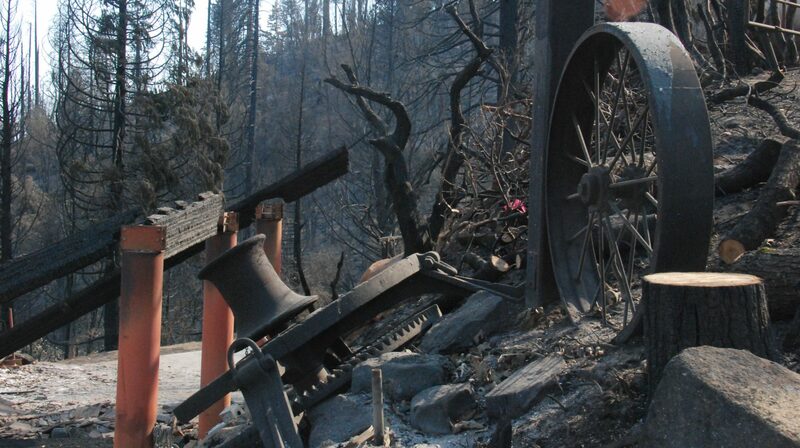 You may remember this old steam engine flywheel resting on the hillside above the retaining wall. 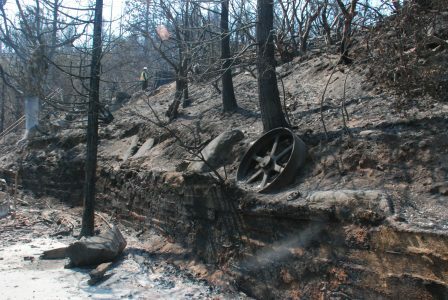 The flywheel is gone, and directly below it are some very clear, very distinctive tire tracks. There were other things missing too. 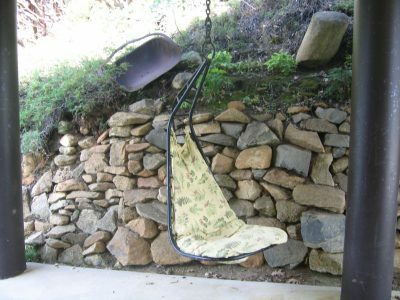 Notice the large ore shovel sitting on the hillside between two of the breezeway support posts. Further investigation revealed some interesting clues. 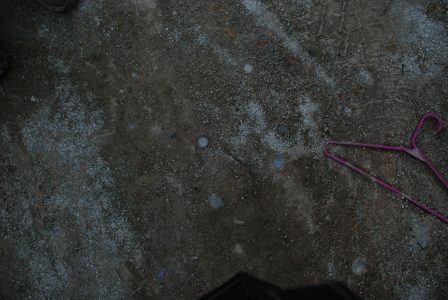 In addition to the tire tracks, there was now a pink coat hanger lying on the ground nearby. That was new. We even know what brand of beer he drinks. And indeed, we also know what the uniquely-customized getaway truck looks like. 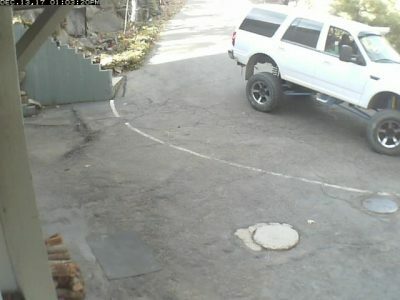 We filed a stolen property report with the Madera County Sheriff and sent them photos of the missing items and the getaway truck. They began an investigation. Then we got a tip from a local that the thief might have tried to sell the items to Rust Brothers Antiques and Collectibles in nearby Coarsegold. 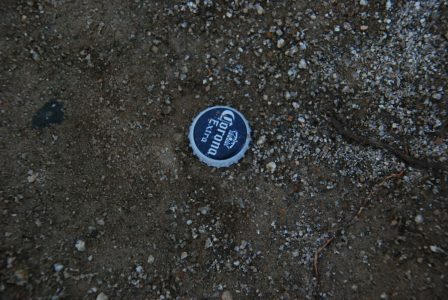 And sure enough, look what we found there! We have now recovered most of the stolen items. As we understand it the thief has been arrested and has confessed to the crime. Once again our sincere thanks go out to the Madera County Sheriff’s Office! 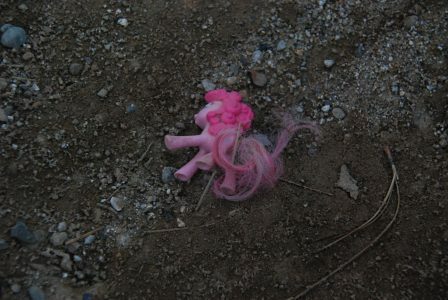 By the way: if you recognize the getaway truck and know who its owner is, please tell his young daughter that we are keeping her Pinkie Pie pony safe and sound. We will gladly return it to her, if she wants it back! 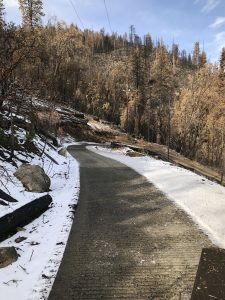 During the week before Christmas we had a small storm come through the Yosemite area. The forecast called only for rain, but the actual storm was cold enough that (surprise!) it left about a half-inch of snow on the ground. This is what we have been preparing for since September. The amount of snow was not enough to make the driveway impassable, but it was enough to make it icy. 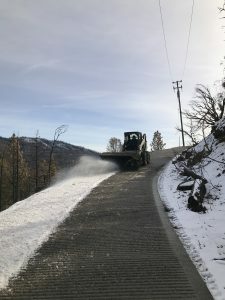 We decided to make a quick trip up before Christmas to clean off the snow and also to install a new Davis Vantage Pro2 Plus wireless weather station — to replace the one destroyed by the fire. We arrived sometime after noon on Winter Solstice, the shortest day of the year. Although it was cold and close to freezing , the day was beautiful and the low afternoon sun had softened the snow and ice. The conditions were perfect for brushing so we got right to it. The brush was all we needed to clear away this small amount of snow. I was even able to brush uphill, which allowed me to clear the entire driveway of snow. Afterward, the driveway was as beautiful as the sunny day itself. And we still had time to install the new weather station too. The new weather station is mounted in exactly the same position as the old one. It will be interesting to see if the local weather conditions are different now, after the fire. At the end of my “Clearance: Half Off” post I mentioned that we still had a problem with the Bobcat: its glowplugs were not working. Unlike gasoline engines, Diesels do not have spark plugs. To ignite their fuel they use the fact that the temperature of any gas will increase as you compress it. The piston compresses air inside a cylinder until it is hot enough to ignite diesel fuel. Then at the proper time the engine injects fuel into the cylinder to ignite it, which then drives the piston back down. But this only works if the temperature inside the cylinder gets hot enough to ignite diesel fuel. If the engine is too cold a diesel engine can’t start without some help. This is what glowplugs are for. A glowplug is essentially a small electric heater installed at the top of the cylinder. When the engine is cold the glowplug will heat the air in the cylinder enough to ignite the fuel. Once the engine is running and warm, the additional heat is not needed. So glowplugs are only needed when the engine is cold. When it got cold enough outside, our Bobcat started warning us that the glowplugs were not working right. And sure enough: the colder it got outside, the more difficult it was to start the Bobcat. 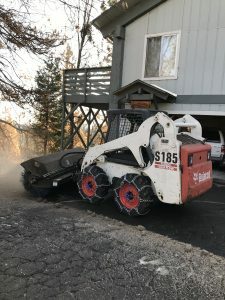 Now remember, the main reason we need the Bobcat is to clear snow from the driveway. So a glowplug warning in cool weather is quite likely to become a show-stopper in cold, snowy weather, right when we need the Bobcat most. This was a problem that we needed to fix before we got snow. Fortunately, glowplugs are pretty simple devices. And a quick review of the Bobcat wiring diagram confirmed that the circuit was pretty simple too. The problem had to be either a bad glowplug or a bad relay. And since there is one glowplug for each cylinder, the Bobcat would likely still start easily if only one glowplug were bad. So it would seem that either all glowplugs had failed (not likely) or something common to all glowplugs had failed (much more likely). 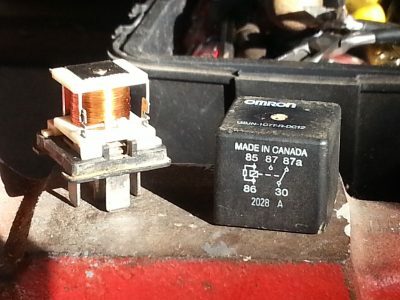 The only thing common to all glowplugs is the relay, which supplies power to them when it is cold out. 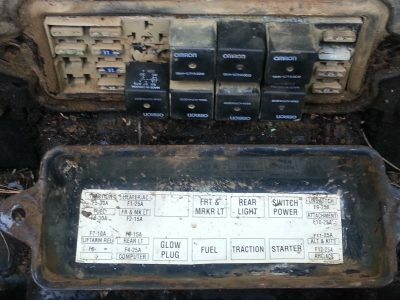 The relay is located in the Bobcat’s fuse box, plugged into a socket there. So our problem could be that the relay was bad, or there was a bad connection in the relay socket. 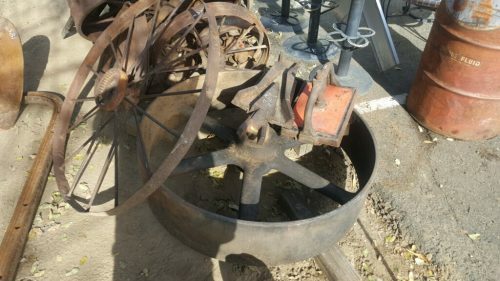 Last weekend I finally had the chance to investigate on-site. I quickly proved that it was the glowplug relay itself by swapping the relay with another, known-good relay nearby. No more flashing warning light, and the Bobcat fired right up. Victory! I could have just left it at that, with the relays swapped. 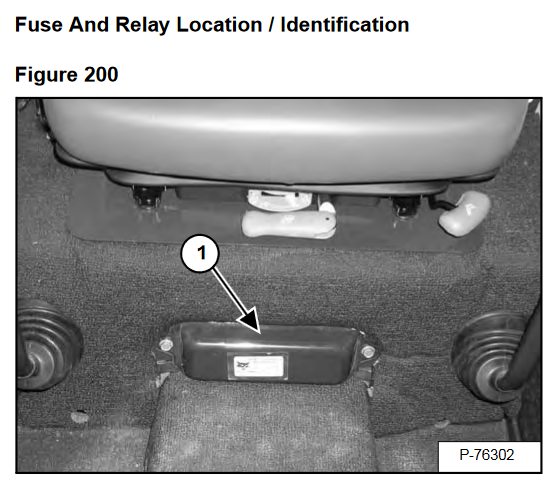 (The known-good relay had controlled the rear floodlights.) But I noticed that it was possible to pop off the relay cover and peek inside. This is what that looks like. The relay and cover separated. It was pretty clear that the relay had gotten wet; it was dirty and corroded inside. But mechanically it still seemed to work. So I spent a few minutes cleaning it, blowing out the dirt and exercising the mechanism. After that, poking around with a volt-ohm meter suggested that it was working again. So I snapped the cover back on and tried it in the Bobcat. Joy ensued. Now I have working glowplugs and rear floodlights. Bring on the snow! 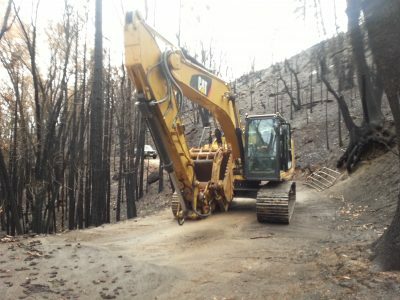 The last task for the excavator was to open up a “back entrance” to the Logger’s Retreat. 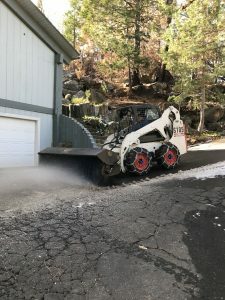 Prior to the fire, the only way to get heavy equipment like the Bobcat into the area behind the garage (including the path to the picnic area) was to actually drive through the garage itself. The original owners had built a third garage door into the back of the garage specifically for this purpose. 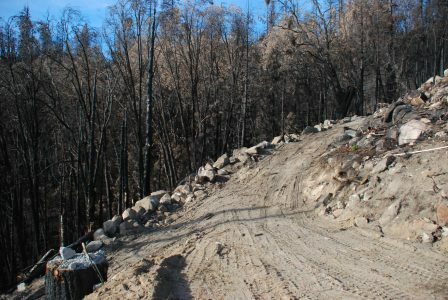 While we still had the excavator available, we rearranged boulders in that area to create an additional driveway. 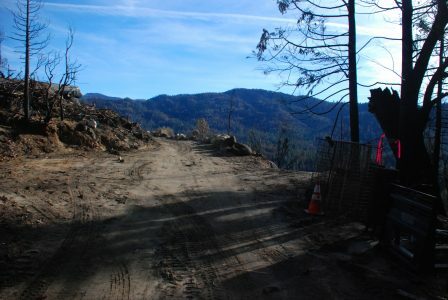 The new driveway where it meets the old path to the picnic area. 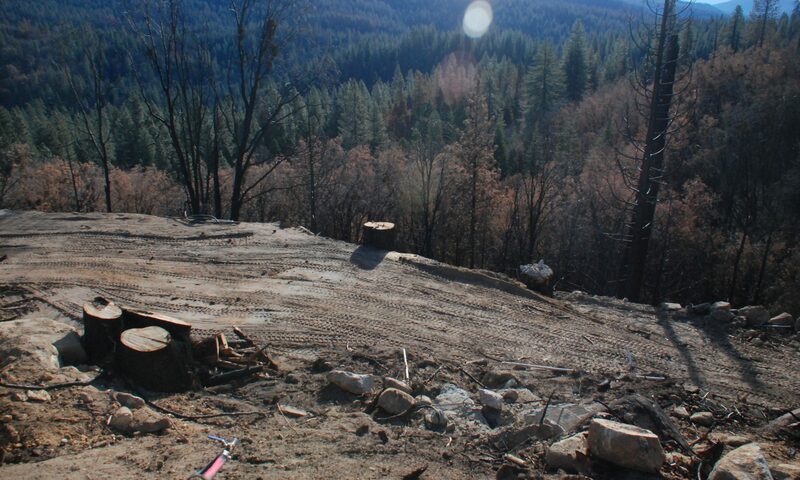 The stump visible at lower left is from the first of the two Ponderosa Pines we felled. 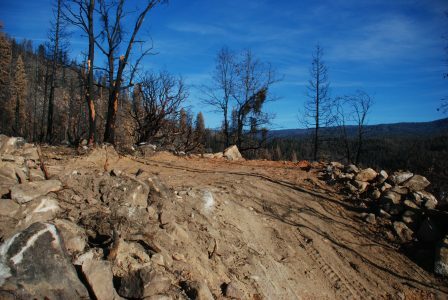 This new driveway meets the forest service fire road right next to where the old Sea Train storage container used to sit. We are currently exploring the possibility of adding living space above the Logger’s Retreat garage. If that becomes a reality, we’ll use this new “back entrance” as the main driveway for that second residence. 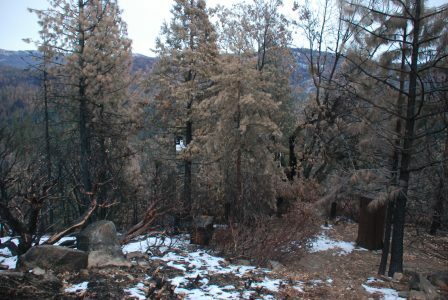 The two tree stumps in the center of the image are where the large Ponderosa Pines used to stand. 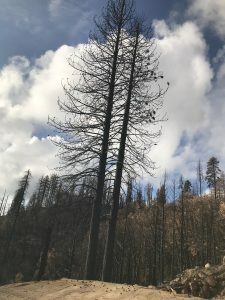 Before the fire, there were two majestic Ponderosa Pines that towered over the garage. After the fire they were still standing, but completely burned from bottom to top. 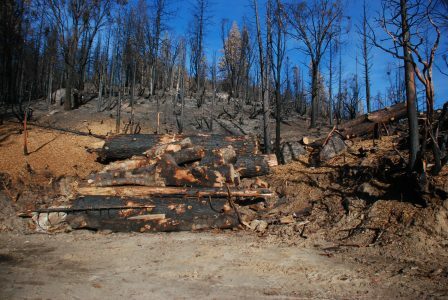 This is what the two Ponderosa Pines looked like after the fire. Sadly, we knew that these old guys would have to come down eventually (one way or another). The only questions were how and when. Well, having a large excavator on site that can carry huge logs is not an opportunity to waste! We didn’t. We dropped the first tree up slope and cut it up into roughly 12 foot lengths. We used the excavator to move and stack those logs along the fire road, across from where the Sea Train storage container used to be. 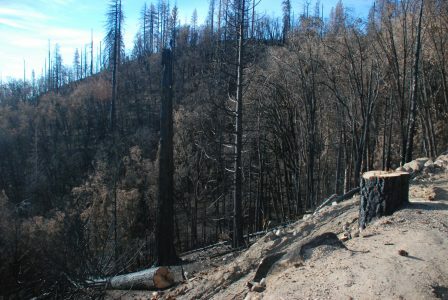 The other Ponderosa was leaning to the east (down slope). Trying to convince it to fall up slope to the west was much more of a challenge. Ultimately we decided it was not worth the risks. So we let it fall down slope, coming to rest on the barren hillside about 50 feet below the stump. The second Ponderosa now lies down slope, below the path to the picnic area. 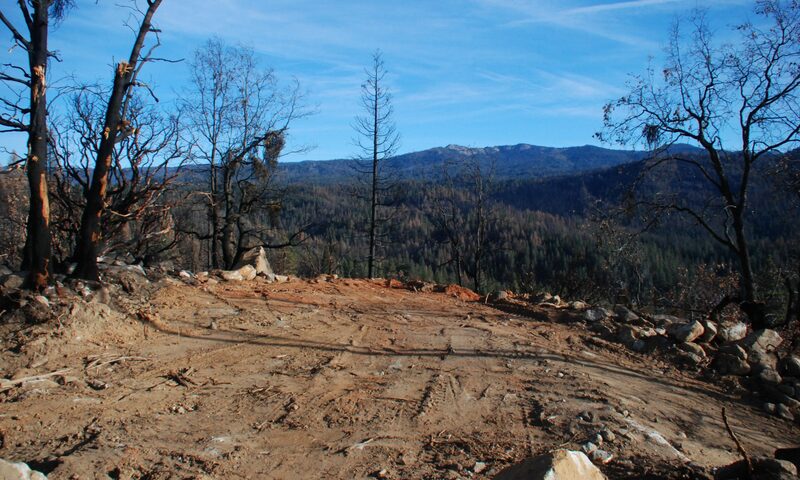 While it was once a mature, forested hillside, the Logger’s Retreat property is now largely open land, covered with fallen trees. 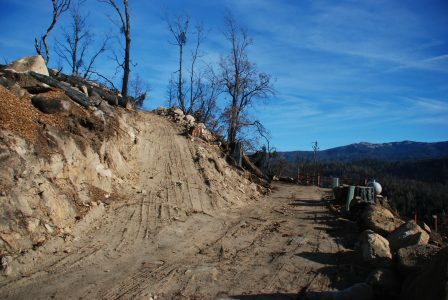 Many of those trees were taken down by PG&E (to protect their power lines) and some were taken down by us. 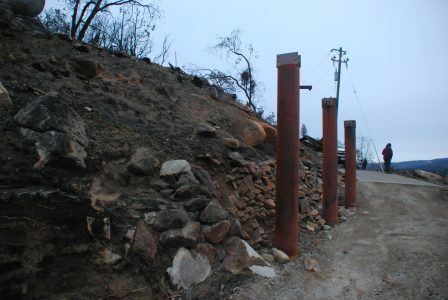 Some of the smaller ones were chipped by PG&E and those chips are useful to help control erosion. But most of the trees are still intact, now just lying across the steep hillside instead of standing tall over it. Our current plan is to mill many of these fallen trees into landscaping timbers. So we may eventually buck (i.e. 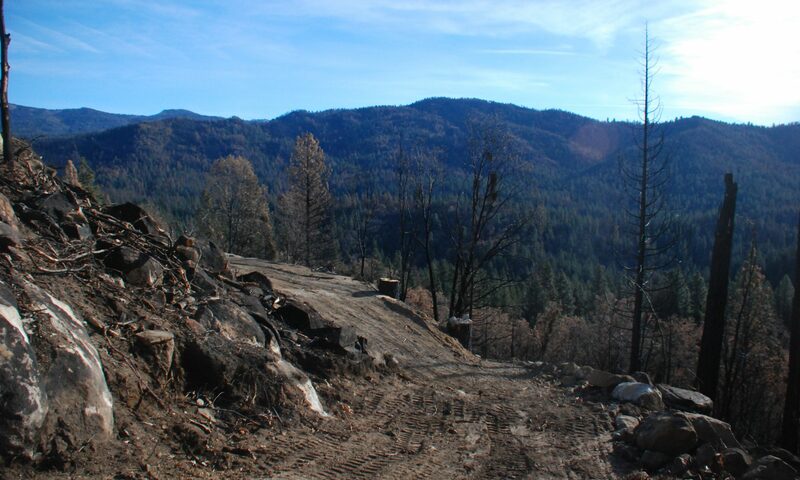 cut up) that second Ponderosa where it lies, and then drag those logs back up the hill. But for now we’ll just leave it on the hillside where it fell. It can be surprising what you can rent when you really want to. We had to move some big rocks. This is what we came up with. You too can rent this excavator for around $600 per day. Beats picking up boulders (and trees) by hand! Easier on the back too. No, it wasn’t me driving; I had some (really great) help with that part. 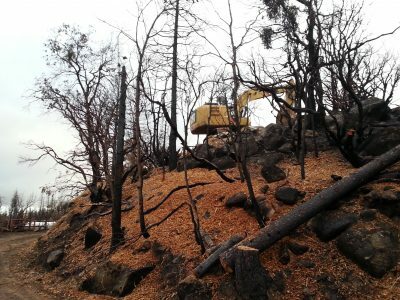 One task for the excavator was to move some large boulders to form a flat pad at the top of the little knoll above our property, where we hope to place several water tanks. These will provide us with a gravity-fed source of water, both for domestic use and hopefully also emergency irrigation that can defend against the next wildfire. 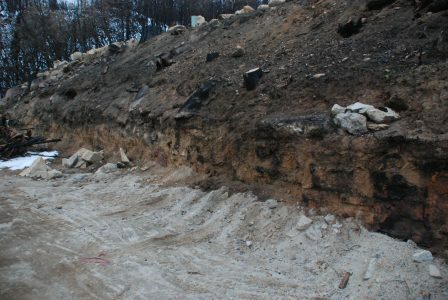 Here you can see the excavator at work on the top of the knoll. Don’t ask how we got it up there (it wasn’t easy). 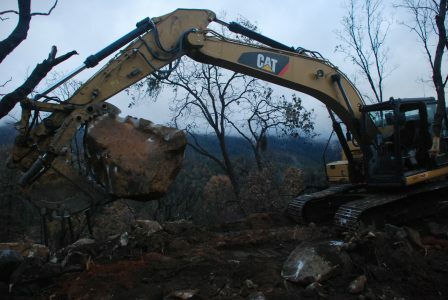 The excavator makes short work of moving large boulders like this one. After a day or so of excavator work, our new pad was finished! Here is the access road to the top of the knoll. We now have plenty of room at the top for several water tanks, as well as enough space to turn a truck around too! I’ll give this grading an A.